Deleting a schema can be be done in various ways depending on what it is you are actually wanting to delete. As local databases are not shared the scenario for deletion is quite simple. You are just asked to confirm that you want to delete the schema. If you say yes then all the database files will be permanantly deleted from your disk. Whether to just remove the definition of the schema from your IJC project and leave the database contents intact for other users. Or to also delete the contents of the database, and if so, exactly what to delete. 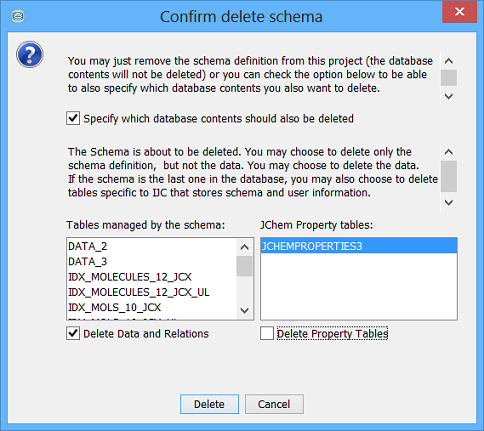 When you ask to delete the schema you will initially see a confirm dialog that ask you to confirm the removal of the schema definition from IJC, and whether you wish to also delete any of the actual contents of the database. Then if you chose to also delete the contents of the database you will then see a dialog asking what it is you want to delete. If you are not currently connected to the database you will go through the connection process before you see this dialog. The IJC meta data tables (with names of IJC_*). These contain the IJC configuration information, but no real data. You should NOT delete any of these tables if other users are still wanting to access the database using IJC. If other users are accessing the database tables through other mechanisms it would be safe to delete the IJC meta data tables, but not the data tables or JChem property tables.